1. Lando, G.; Mosca, A.; Bonora, R.; Azzario, F.; Penco, S.; Marocchi, A.; Panteghini, M.; Patrosso, M.C. Frequency of butyrylcholinesterase gene mutations in individuals with abnormal inhibition numbers: An Italian-population study. Pharmacogenetics 2003, 13 (4), 1-6. 2. Liu, W.; Cheng, J.; Iwasaki, A.; Imanishi, H.; Hada, T. Novel mutation and multiple mutations found in the human butyrylcholinesterase gene. Clin. Chim. Acta 2002, 326 (12), 193-199. 3. Masson, P.; Chatonnet, A.; Lockridge, O. Evidence for a single butyrylcholinesterase gene in individuals carrying the C5 plasma cholinesterase variant (CHE2). FEBS Lett. 1990, 262 (1), 115-118. 4. Hada, T.; Yamawaki, M.; Moriwaki, Y.; Tamura, S.; Yamamoto, T.; Amuro, Y.; Nabeshima, K.; Higashino, K. Hypercholinesterasemia with isoenzymic alteration in a family. Clin. Chem. 1985, 31 (12), 1997-2000. 5. Oimomi, M.; Ohkawa, J.; Saeki, S.; Baba, S. A familial study of C5+cholinesterase and its frequency in the normal population. Gastroenterol. Jpn. 1988, 23 (6), 680-683. 6. Darvesh, S.; Hopkins, D.A. ; Geula, C. Neurobiology of butyrylcholinesterase. Nat. Rev. Neurosci. 2003, 4 (2), 131-138. 7. Yen, T.; Nightingale, B.N. ; Burns, J.C.; Sullivan, D.R. ; Stewart, P.M. Butyrylcholinesterase (BCHE) genotyping for post-succinylcholine apnea in an Australian population. Clin. Chem. 2003, 49 (8), 1297-1308. 8. Dey, D.C.; Maekawa, M.; Sudo, K.; Kanno, T. Butyryl-cholinesterase genes in individuals with abnormal inhibition numbers and with trace activity: One common mutation and two novel silent genes. Ann. Clin. Biochem. 1998, 35 (pt 2), 302-310. 9. Liu, W.; Hada, T.; Fukui, K.; Imanishi, H.; Matsuoka, N.; Iwasaki, A.; Higashino, K. Familial hypocholinesterasemia found in a family and a new confirmed mutation. Intern. Med. 1997, 36 (1), 9-13. 10. Maekawa, M.; Sudo, K.; Kanno, T.; Kotani, K.; Dey, D.C.; Ishikawa, J.; Izumi, M.; Etoh, K. Genetic basis of the silent phenotype of serum butyrylcholinesterase in three compound heterozygotes. Clin. Chim. Acta 1995, 235 (1), 41 -57. 11. Bartels, C.F. ; van der Spek, A.F.L. ; La Du, B.N. Two polymorphisms in the non-coding regions of the BCHE gene. Nucleic Acids Res. 1990, 18 (20), 6171. 12. Primo-Parmo, S.L. ; Bartels, C.F. ; Wiersema, B.; van der Spek, A.F.L. ; Innis, J.W. ; La Du, B.N. 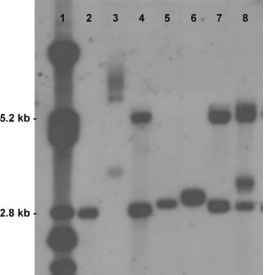 Characterization of 12 silent alleles of the human butyrylcholinesterase (BCHE) gene. Am. J. Hum. Genet. 1996, 58 (1), 5264. 13. Lee, D.W.; Liu, H.C.; Liu, T.Y. ; Chi, C.W. ; Hong, C.J. No association between butyrylcholinesterase K-variant and Alzheimer disease in Chinese. Am. J. Med. Genet. 2000, 96 (2), 167-169. 14. Ehrlich, G.; Ginzberg, D.; Loewenstein, Y.; Glick, D.; Kerem, B.; Ben-Ari, S.; Zakut, H.; Soreq, H. Population diversity and distinct haplotype frequencies associated with ACHE and BCHE genes of Israeli Jews from Trans-Caucasian Georgia and from Europe. Genomics 1994, 22 (2), 288-295.